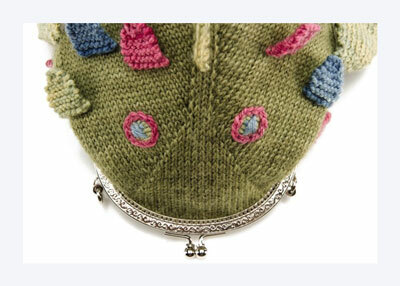 Here’s a fun way to showcase a single skein of luxury knitting yarn: Knit a handbag with a great big mouth! The gorgeous, delicate colors in this hand-dyed yarn are derived exclusively from natural dyestuffs. A combination of rare Polwarth wool and decadent Tussah silk lends a touch of sophistication to this whimsical piece. Hook, line, and sinker handbag schematic. With MC, CO 19 sts. Working back and forth in St st, work 2 rows. Work 10 more rows, incr 1 st at each end of every RS row — 29 sts. Row 1: K1, M1R, k3, M1R, k21, M1L, k3, M1L, k1 — 33 sts. Row 3: K1, M1R, k6, M1R, k19, M1L, k6, M1L, k1 — 37 sts. Row 5: K1, M1R, k9, M1R, k17, M1L, k9, M1L, k1 — 41 sts. Row 7: K1, M1R, k12, M1R, k15, M1L, k12, M1L, k1 — 45 sts. Row 9: K1, M1R, k15, M1R, k13, M1L, k15, M1L, k1 — 49 sts. Row 11: K1, M1R, k18, M1R, k11, M1L, k18, M1L, k1 — 53 sts. Break yarn and place sts on holder. Make 2nd mouth piece to match. Place sts of both mouth pieces on circular needle or DPNs, PM, and join for working in rnds — 106 sts. Work 1 rnd even. Rnd 1: K1, M1R, k21, M1R, k9, M1L, k21, M1L, k2, M1R, k21, M1R, k9, M1L, k21, M1L, k1 — 114 sts. Rnd 3: K1, M1R, k24, M1R, k7, M1L, k24, M1L, k2, M1R, k24, M1R, k7, M1L, k24, M1L, k1 — 122 sts. Rnd 5: K1, M1R, k27, M1R, k5, M1L, k27, M1L, k2, M1R, k27, M1R, k5, M1L, k27, M1L, k1 — 130 sts. Rnd 7: K1, M1R, k30, M1R, k3, M1L, k30, M1L, k2, M1R, k30, M1R, k3, M1L, k30, M1L, k1 — 138 sts. Next rnd: *K1, ssk, k30, M1R, k3, M1L, k30, k2tog, k1; rep from * once more. Rep last 2 rnds until piece measures 7″ from CO.
Set-up rnd: K34, PM, k35, PM, k34, PM, k35. Next rnd: K1, ssk, knit to 2 sts before M, k2tog, k1, ssk, work to 3 sts before M, k2tog, k2, ssk, knit to 2 sts before M, k2tog, k1, ssk, knit to last 3 sts, k2tog, k1. Work 3 rnds even. Rep last 4 rnds 11 more times — 42 sts. Next rnd: *K1, ssk, knit to M, k1, ssk, knit to 3 sts before M, k2tog, k1; rep from * once more — 36 sts. Next rnd: K9. Place 18 sts on each of 2 DPNs. Holding DPNs parallel, work 1 row in k1, p1 rib, working each st through 1 st from each DPN — 18 sts. With CC1, work 2 rows in k1, p1 rib. 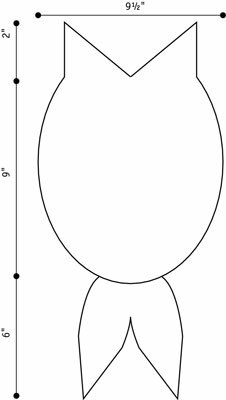 Cont in patt, inc 1 st at each end of next 6 RS rows — 30 sts. Next row: Work 15 sts, turn. Cont working in rib on 1 side of tail only. Next row: Dec 1, work to last st, inc 1. Work 1 row even. Inc at each end of every 4th row 3 times — 21 sts. Dec 1 st at each end of every RS row 9 times — 3 sts. Next row: Sl1, k2tog, psso — 1 st. Break yarn and pull through last st.
Make opposite tail fin, reversing shaping. Holding piece with tail up, measure up 3-1⁄2″ from corner of mouth opening. 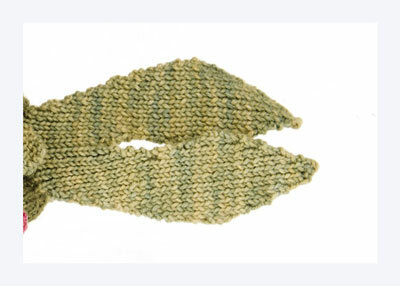 With CC1, pick up and knit 10 sts, centered on side shaping, as shown. Work 1 row in k1, p1 rib. Inc 1 st at each end of next row. Rep last 2 rows 5 more times — 22 sts. Dec 1 st at each end of next 2 RS rows — 18 sts. BO in patt. Make 2nd fin on opposite side of body to match. Holding piece with tail on right, measure 2″ away from tail fin. 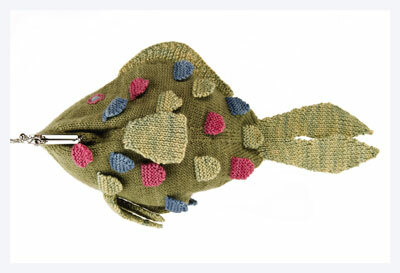 With CC1, pick up and knit 42 sts along top of fish, ending about 1″ before beg of triangle on fish’s face. Row 1: Sl1, *k1, p1; rep from * to last st, k1. Row 2: Sl1, work in patt to last 5 sts, wrap & turn. Row 3: Sl1, work in patt to last 7 sts, wrap & turn. Row 4: Sl1, work 26 sts in patt, wrap & turn. Row 5: Sl1, work 19 sts in patt, wrap & turn. Row 6: Sl1, work 16 sts in patt, wrap & turn. Row 7: Sl1, work 13 sts in patt, wrap & turn. Row 8: Sl1, work 10 sts in patt, wrap & turn. Row 9: Sl1, work 7 sts in patt, wrap & turn. Row 10: Sl1, work 4 sts in patt, wrap & turn. Row 11: Sl1, work in patt to end, picking up wrap from prior row and working tog with st at each gap, turn. Row 12: Sl1, work in patt to end, picking up wrap from prior row and working tog with st at each rem gap, turn. 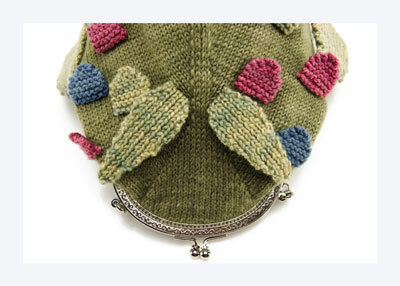 With CC1, pick up and knit 7 sts at end of head shaping, as shown. Work in k1, p1 rib, inc at each end of every RS row 3 times — 13 sts. Dec 1 st at each end of every 4th row 5 times — 3 sts. Next row: Sl1, k2tog, psso — 1 st. Break yarn and thread tail through last st.
Make 2nd fin on opposite side to match. Holding piece with tail up, pick up and knit 9 sts. Work in garter st for 9 rows. Next 3 RS rows: ssk, knit to last 2 sts, k2tog—3 sts. BO. Weave in ends at edges of all fins and scales. Wherever possible, pull ends to inside of body and trim to approx 2″ long. Block piece, laying flat with mouth open and tail flat. Check to be sure scales on underside of piece are laying flat, in the same direction. Turn piece over occasionally during drying. Lay piece flat on top of folded lining fabric. Trace around piece, adding a 1⁄4″ seam allowance. Cut out lining (2 pieces) along tracing line. With RS tog, stitch sides of lining, leaving tail open. Press seams open. Place purse inside lining, with RS tog, matching lining seams to mouth centers. Pin edges tog along mouth opening. Stitch lining and purse tog with a 1⁄4″ seam allowance. Carefully turn piece RS out through tail opening in lining. Stitch lining closed. Push lining inside bag. Gently press mouth edge with lining fabric facing up, toward iron. 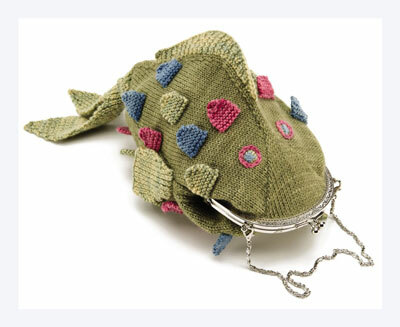 Sew mouth edge into purse frame, easing in fullness as needed. 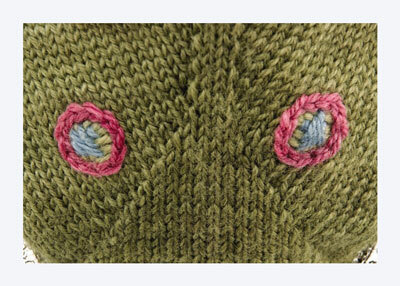 The opening size of the mouth is determined by the purse frame after the knitting is sewn (eased) into it.